I've always been an advocate for reusing, recycling and repurposing stuff, so when I came across the idea of using coffee grounds in face and body scrubs I was really keen to try it out. I drink coffee pretty much every day. Before discovering this concept, I would throw away my coffee grounds and feel a little guilty for it. 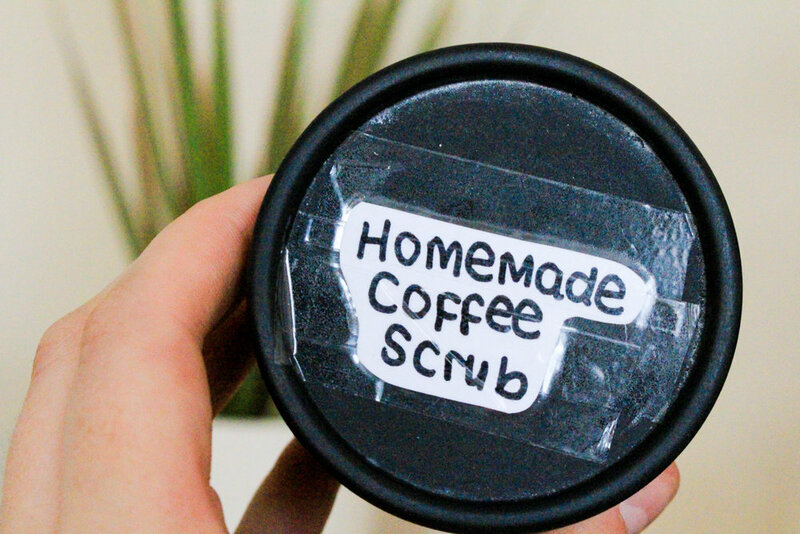 Now, I save them in a pot in the fridge and use them in this amazing coffee scrub recipe. Caffeine is believed to be great for waking up the skin and minimising the appearance of cellulite. Meanwhile, it can also reduce puffy eyes if used on your under-eye area. There's a tonne of articles out there going into depth about the benefit of coffee scrubs, but this Huffington Post one sums it up nicely. On top of all this, the tiny grounds in the coffee make an excellent exfoliant without having to use a shop-bought scrub with nasty plastic microbeads. So, let's get into the recipe. Coffee grounds (used or unused). Honey (skip this if you're vegan). An old pot, jar or tub. 1. Wake up and smell the coffee. Once the coffee grounds have cooled down you can take them out of your machine or filter and pop them in a mixing bowl. You can also use 'unused' grounds, but the water makes them a lot softer and the whole reason I love this recipe is that it makes use of something I'd usually throw away. If you'd like to make a bigger batch of this scrub, I would suggest collecting a couple of days worth of coffee and setting it aside in a tub in the fridge to keep fresh. For extra scrubbing power, I like to add a sprinkling of oats into the mix. 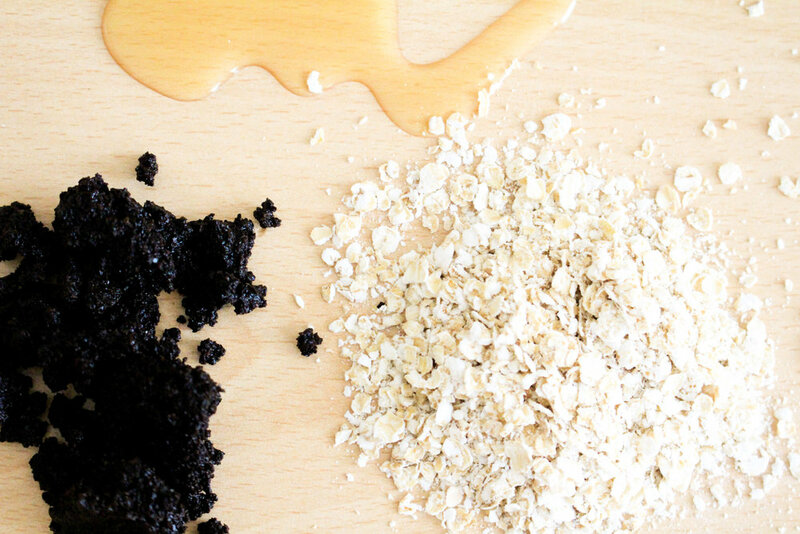 Again, oats are biodegradable so they're perfect to use in this eco-friendly scrub. I also think oats are super cheap and something that most people have in their cupboards anyway. 3. Mix in the honey. Honey also has a lot of benefits for your skin. It has anti-bacterial properties and is used in a lot of natural skin care. I usually use one teaspoon to two scoops of coffee, but it's entirely down to preference. 4. Pour in the oil. The oil helps to make the scrub a bit more hydrating. But, if you have oily skin I wouldn't go crazy with this step. I usually mix in a couple of drops per two scoops of coffee. Olive oil is full of antioxidants and leaves your skin feeling super soft after you wash the scrub off. If it's too runny, simply add in more oats. 5. Time to try it out. Dig out an old tub or jar to store your brand new scrub in. I washed out one of my empty Lush pots. I added a cute label too, but the ink ran as soon as I tried it out in the shower! Do you have any tips for reusing and repurposing? I'd love to hear them so be sure to comment below or Tweet me @retroandthrift.